Bridezilla uses a lie detector on her guests to find "snitch". When a bride's bizarre dress code demands were leaked, she made her friends take a polygraph. Last week, we brought you the story of a bride who’s “24K” Hawaii wedding plans involved categorising her guests into weight. But the saga has continued – and she now has allegedly hosted a “polygraph party” to find out which of her friends leaked her viral Facebook post to the internet. In case you missed it, an unnamed American bride, whose Facebook post was shared on Reddit before being spread widely, specified guests commit to wearing not one, but two very specific outfits to her wedding in Hawaii next year. The first outfit requirements for a “synchronised” dance routine were set according to weight, with women under 71kg wearing bright colours and women over 71kg dressed in black, and men similarly split. 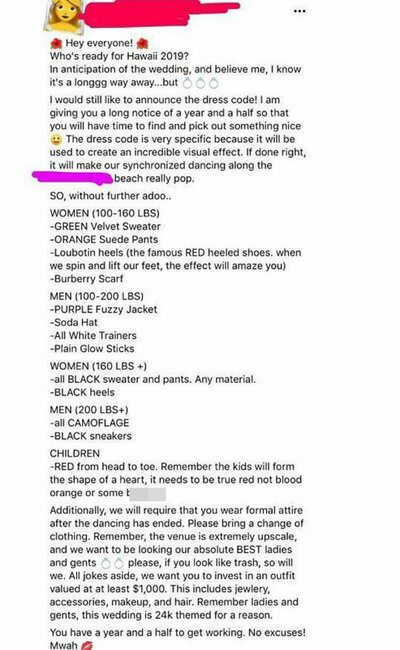 The Facebook post – intended for guests’ eyes only – also went into great detail about how the next outfit should be worth at least $1000. 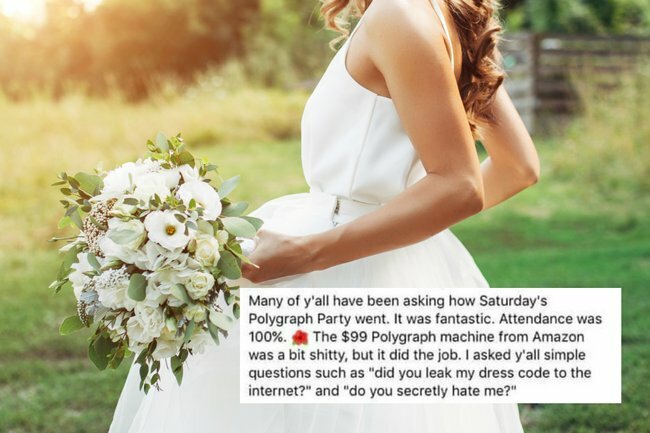 And the bride was not too pleased when she saw her requests go viral, with another leaked Facebook post claiming she held a party involving a lie detector to find out who shared the story. After using a US$99 lie detector on her friends, asking questions like “Did you leak my dress code to the internet?” and “Do you secretly hate me?” the bride found her “snitch”. 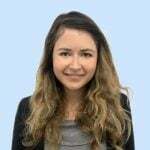 “Friends, it is with only the deepest joy that I can announce the identification of the snitch,” she told her guests in a follow-up Facebook post. “My former friend, Stephanie was immediately removed from my property. “She confessed to leaking my posts and ridiculing me online. The bride then used the opportunity to remind male guests under 90kg to buy their "soda hats", which she has graciously allowed to be substituted for "helicopter hats"
And she would like to inspect their dance outfits within a month. "I will be telling each and every one of you what&apos;s wrong and how to improve it." While these do read like the perfect ranting of a bridezilla who has just tasted real power for the first time and is definitely letting it go to her head, many commenters have grown a little suspicious of the posts&apos; authenticity. "My hypothesis is it’s definitely fake after seeing this. I’ll believe it when [the original poster] or someone else that’s a whistleblower leaks the video," one Redditor wrote. 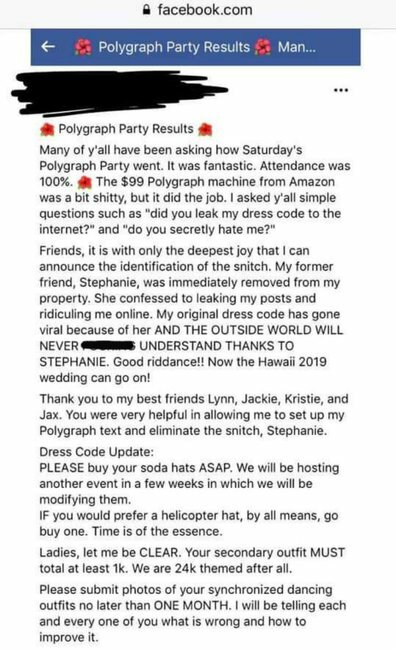 Others questioned how this new Facebook post could be leaked if the "snitch" Stephanie, has been kicked out of the wedding. But it&apos;s also likely that more than one person would resent this extravagant dress code. The bridezilla reminded guests in her original post that the dress code was "very specific" to create a visual effect during their synchronised dance along the beach. For some, it involved Loubiton heels and a Burberry scarf. But then she expected guests to also spend US$1,000 on their outfit to the actual wedding. “Remember the venue is extremely upscale and we want to be looking our absolute BEST ladies and gents,” she wrote. "Remember ladies and gents, this wedding is 24k themed for a reason."